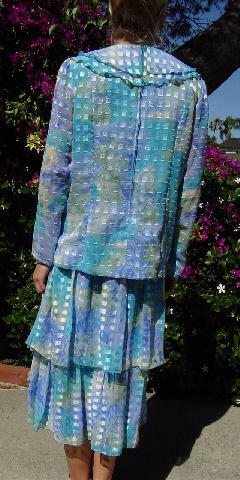 This two-piece outfit is by Melody Ann, is 100% polyester, and was made in the USA. 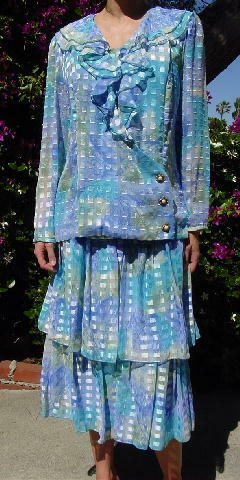 The top (except for the sleeves) and the skirt are lined. 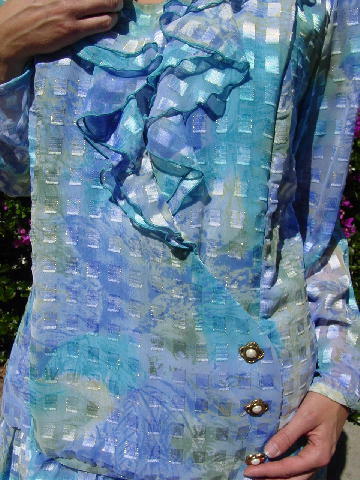 There is a 2-layered ruffled neckline. The insert covering the 7" deep bodice is sewn in place and the crossover front is sewn in place on the right underside and the left front is held in place by the 3 buttons which are sewn to the left side. The top is put on over your head. The long sleeves have a loop and one aqua button at each sleeve end. 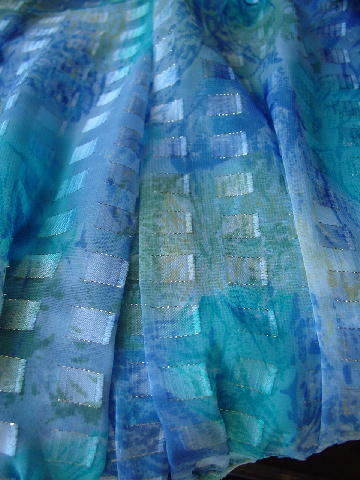 The skirt has an elastic waistband and 6 1/4" below the waist starts the first tier of fabric. It's 12 1/2" long, has mini pleats, and flows freely over the lining. The second tier is attached only at the top to the lining. It also has mini pleats and is 13" long. It has an elevated thread rectangular pattern which is outlined on 2 sides by gold metallic thread. It's in various shades of blue, white, yellow, and green.